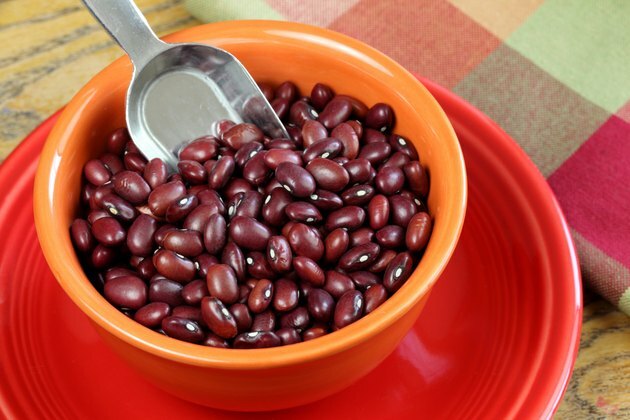 Of the dry bean varieties, both kidney beans and the type known simply as small red or red beans sport a deep, burgundy color, while pinto beans are a lighter red color. All adapt to a range of cooked dishes, including baked beans and refried beans. Cooking them begins by simmering beans until they become fork-tender, after which they can be served as a side dish, added to soups or chilled for salads. Baked beans and refried beans also start with simmered beans. Before you begin cooking your red beans, soak them overnight in three times their volume of water. Remove any old beans or debris that floated to the top during the cooking process. Drain the beans in a colander and rinse under cool running water. Put red beans in a nonaluminium cooking pot to avoid imparting a metallic taste to the beans. Pour cooking liquid over the beans so that the beans are covered by 2 inches. Cooling liquid choices include water, chicken broth, tomato juice, beef broth or vegetable broth. Choose low-sodium versions of broths or juices. Measure 1 tbsp. canola or olive oil and add it to the pan in order to reduce foam during the cooking process. Sprinkle in chosen seasonings, which might include dried herbs or spices. Don't add salt until the end of the cooking process or your beans will take longer to cook. Turn the heat to medium-high and bring the beans to a slow boil. Lower heat to a simmer and prop the pot's lid so that it releases some steam. Check the beans for tenderness after 30 minutes. Some beans take as long as 1 1/2 hours. Add salt, if desired, to beans when they are almost tender. Remove from heat and cool slightly. If the beans are soupy, drain before serving. Follow Steps 1 to 7 in the Simmered Method section, except cover the beans with 3 inches cooking liquid rather than 2 inches. Combine onion, dry mustard, molasses and regular bacon, vegetarian bacon or olive oil. Put the pan's cover on and place the covered pan in the oven. If you do not have an oven-proof pan, ladle the beans into a bean pot or casserole dish with a lid. Cook at least 40 minutes before checking for tenderness. Remove the baked beans from the oven and cool slightly before serving. Follow Steps 1 to 9 in the Simmered Method section, using garlic powder and chopped onion as your cooking seasonings along with the olive oil. Drain the beans, reserving the cooking liquid in bowl. Put drained beans in a heavy skillet, turn the heat to medium high and mash the beans as the pan heats. Pour 1 cup of the reserved bean liquid into the mashed beans, continuing to stir and mash the beans until the liquid is absorbed. Remove from heat when the refried beans reach the texture and thickness you prefer. The smaller the bean, the more quickly it will cook. Small red beans may cook in as little as 30 minutes. Follow package directions and check intermittently during the simmering stage. Draining the soaked beans and putting them in a pan with fresh water helps eliminate the risk of gas some people experience after eating dry beans. Don't limit yourself to the type of beans called for in traditional recipes. If you have only red beans on hand instead of the classic navy for Boston baked beans, use the red beans anyway. Experimenting may result in new favorites, as with substituting garbanzo beans for red or pinto beans when making a batch of refried beans.